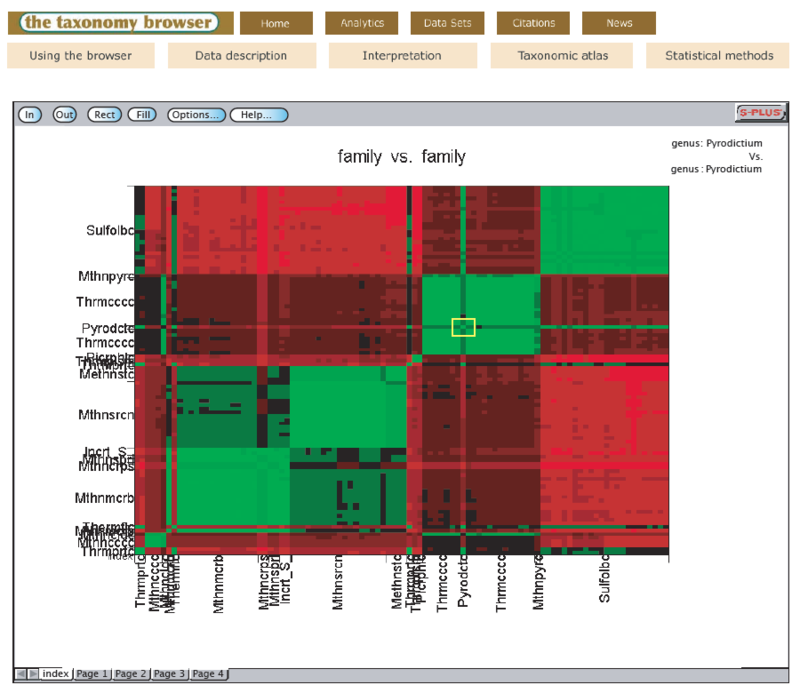 Interactive heatmaps are accessible from the taxonomic atlas and analytics pages. S-Plus graphlets support zooming and allow visualization of regions of interest in greater detail. Dr. Garrity will be presenting a taxonomy browser backed by a novel algorithm for building self-organizing and self-correcting classifications. Recently, we developed an algorithm that builds self-organizing and self-correcting classifications. We have applied this algorithm to the problems arising from sequence annotation errors on prokaryotic classification. The comparison of the optimized classifications developed with our algorithm with other taxonomic proposals has allowed us to resolve outstanding problems in prokaryotic classification and taxonomy. To make such comparisons available to the research community, we have built a website that allows users to compare the current Bergey’s Taxonomic Outline with an optimized classification. The website serves as user interface to a dedicated analytic server, built using StatServer (Insightful). The application allows users to select the taxonomic group they are interested in, choose how they want the results to be organized (that is, at the species, genus or family level) and display the comparison. The organization of the compared classifications is visualized in the form of shaded evolutionary distance matrices. The colors of the matrix indicate the distances between the pairs of sequences in the matrix. The grouping of the colors in the matrix reflects the higher level groupings of the sequences (and, by extension, of the parent organisms). One matrix is arranged according to the hierarchy of the Outline and the other matrix is arranged according to the groupings generated by the classifier. Users can drill down in the display to see the comparisons at lower taxonomic levels or move up the hierarchy. The side-by-side comparison illuminates possible solutions to evident problems in the current classification. We illustrate how the taxonomy browser works by looking at the classification and taxonomy of the Archaea. [permalink] Posted May 23, 2004.